MainAll NewsInside IsraelArab sells M-16 assault rifle in Tel Aviv online? Arab sells M-16 assault rifle in Tel Aviv online? Tamimi of Ajami neighborhood posts ad asking for 32,000 shekels for apparently stolen weapon; activist blows whistle before finding fake. An Arab citizen of Israel living in southern Tel Aviv posted an ad online on Tuesday, seeking to sell an apparently stolen M-16 semi-automatic assault rifle, according to the post - which later turned out to be a fake. The advertisement, posted to the popular yad2 website, includes a picture apparently of the seller showing himself from the shoulders down while holding the M-16 with an accessory grip. 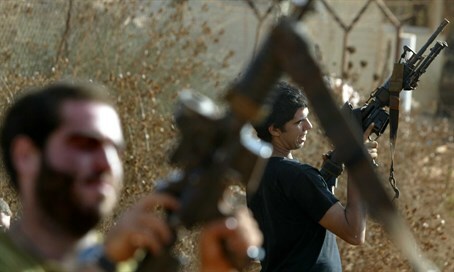 The weapon is commonly seen among IDF soldiers. According to the ad, the seller's name is Tamimi, a popular Arab surname. The email listed is mochmd22@gmail.com, indicating his first name may likely be Mohammed. The ad listed the location of the seller as being in the southern Tel Aviv-Yafo Arab neighborhood of Ajami. The neighborhood and email were later removed from the post, although it continued to list the seller's location as Tel Aviv. Tamimi asked for 32,000 shekels (over $8,200) in the ad for the apparently illegal weapon, which was listed as being in "used" condition. The description of the product in the ad reads "sms only," written in English. Bentzi Gopshtain, head of the anti-assimilation group Lehava, revealed the ad on his Facebook page on Wednesday morning. He contrasted the seemingly free hand given to the Arab seller as compared to the police crackdown and Knesset opposition to his own group, whose actions have been vindicated as fully legal by the courts. "Mohammed is selling an M-16. And the police? They're busy trying to prevent a Lehava conference in Netanya and opposing a (protest) march by Otzma Yehudit in Arara," he wrote, referencing the hometown of Israeli Arab terrorist Nashat Milhem where he hid out supported by locals and family for a week. Milhem murdered three Israelis in a terror attack in Tel Aviv on January 1. "Share the embarrassment," concluded Gopshtain. One user commented on the post, linking the official police page in their comment and jokingly writing, "Israeli police in response: at least he's selling it, one less attack." In reply, another user wrote: "the question is who he'll sell it to..."
Later on Wednesday Gopshtain wrote a follow-up message, saying, "the picture that I posted earlier about the M-16 still is on the yad2 boards. But apparently it was a fake done by someone, and therefore it's been deleted (from my page)."